My Geek Alert is at Amber! GeekBoy July 22, 2008 July 22, 2008 3 Comments on My Geek Alert is at Amber! Okay, so here’s the thing. As a geek, I’m starting to get a little tired of being excited all the time. “Dude, did you see the awesome trailer for the Watchmen movie?” “OMG, did you get the link I sent with the teaser for the new Terminator movie?” “Did you hear the rumor that there might be as many as THREE Battlestar Galactica movies?” Well, did you? DID YOU??? The truth is, I think I’m just about all trailered and teasered and rumored out right now. How much sustained anticipation can a person actually experience before their brain simply shuts down, or — as in my case — before the state of being excited actually loses all meaning? I’m reminded of the Terror Alert System. 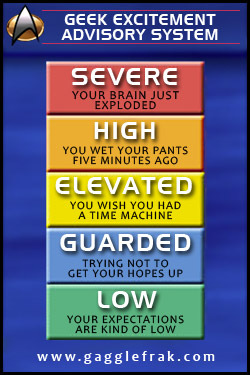 As you may or may not know, the U.S. alert level hasn’t gone any lower than yellow since the day it was first instituted by the Department of Homeland Security back in 2002. That’s six years of either “Elevated” or “High” risk of terrorist attack. What message does that send, and as a society, how do we process that? By being stressed, of course. All the time. By being worried and afraid. Which, many would argue (and I would agree), is exactly what this administration wants us to do. Be afraid. Be very afraid. But what does this have to do with geeks? Everything. Because apparently, we geeks are at war. A War on Boredom. And Hollywood is determined to win this war for us if it means they have to remake or sequelize or prequelize every crappy science fiction TV show and movie that was ever made. What’s more, they will not rest until each and every comic book hero has had a chance to show off his/her spandex costume on the silver screen. But they can’t do it alone. Just as Peter Pan needed the audience to clap to save Tinkerbell’s life, Hollywood needs the geek population to believe in it, to be excited by it, to virally propagate it, in order to keep it strong enough to churn out more sci-fi and comic book movies than we knew we even needed. To be honest, it’s not really the number of geek-focused shows and movies that bothers me. After all, I lived through the Great Geek Depression of the 70s and 80s — the pre-Whedon, pre-Burton-Batman years, when we were lucky to get a Star Wars, a Superman, a Blade Runner, or a Terminator on the big screen once a year or so. And television? Forget it. We accepted the campy Lost In Space and Battlestar Galactica and Adam-West-Batman that was put on our plates, we gobbled it up, and we asked for seconds. We knew nothing about seamless special effects or multi-episode plot arcs or thinly-veiled social metaphors. We used our imaginations — honed after years spent reading books — to fill in the gaps, and to convince ourselves that what we were seeing was more realistic, more profound than it really was. So it’s not the number of these projects that bothers me. By all means, Hollywood, keep cranking them out, both the good and the bad. I’ll take too much sci-fi — and even too much bad sci-fi — over NO sci-fi, any day of the week. But what I think I can live without is the constant, long-term hype. For instance, do I really need to KNOW that in two years, they plan to release Iron Man 2? I mean, I loved the first movie. LOVED it. And some day, I look forward to seeing a sequel. But I really don’t need to start thinking about it right now. Just as I don’t need to see a trailer for Watchmen, when the movie isn’t due to release for 8 months. Or a jumpy/jaggy teaser trailer for Terminator 4, which isn’t due out for another 10 months. And I really don’t need to be getting my hopes up about Whedon’s new Dollhouse show, which won’t see the light of day until January. And don’t even get me started on SciFi Channel’s decision to split the final season of Battlestar Galactica into two parts. Bastards. So, getting back to my original question: How much sustained anticipation can a person actually experience before their brain simply shuts down, or — as in my case — before the state of being excited actually loses all meaning? The fact is, Hollywood has done such a great job of supplying quality (or close enough to quality) sci-fi shows the past few years that it’s all I can do to keep up with them, to actually WATCH everything that looks good to me. Increasingly, I find that I don’t have the time or the energy to also work myself into a frenzy over every cool project that is or might be rolling down the pike next week, next month, or next year. And yet I do it, like everybody else. I let myself get excited over the prospect of an Avengers movie in 2010. I swap emails about it with my friends. I read and comment on blogs that post about it. I wonder who’ll they’ll cast as Captain America and who will direct it. And I’m not even that big of an Avengers or Captain America fan! Mostly, I blame Hollywood. It’s in their best interest to keep us as excited as possible, right? To stoke up the hype machine, get us to do their marketing for them, then sit back and reap the rewards. Of course, what they probably never could have expected is that the geek community is growing in leaps and bounds. The definition of what it means to be a geek — for entertainment purposes — has broadened considerably over the past few years. Just ask anybody who’s going to the overburdened San Diego Comic Con next weekend what the impact of the mainstreaming of sci-fi and comic books is. Hell, even GIRLS ARE GEEKS NOW! Go figure. Combine that with the viral nature of the internet, and I’m amazed that movie studios need to market their projects at all any more … but they do. And in a BIG way. And we eat it up. Then we puke it back out. Then we eat it up again, over and over. So really, there’s plenty of blame to go around. If we weren’t buying the hype, they wouldn’t be selling it. Anyway. So if you send me the link to a movie trailer, and you wonder why I’m not peeing my pants over it, this might be why. It’s not that I didn’t like it. It’s not that I’m not looking forward to seeing the movie when it comes out in 2012. I’m just tiring of changing my pants all the time. Love your Geek Excitement Advisory System. I’m on constant Orange for the time being. But when I saw the Dark Knight I was so far past Red I was in the ultraviolet. Er, beyond red is infrared. Ultraviolet is at the other end of the spectrum. Personally, from a metaphor standpoint, I would have though that beyond red was white — you know, as in yellow hot, orange hot, red hot, white hot.